Today, I thought I'd start a series (a very long series actually) about what my favorite little parts are of each land in all of the four different Walt Disney World theme parks. Each land, whether it's in the Magic Kingdom, Disney's Animal Kingdom, or even Epcot, has things that make it unique and Disney to me. They all have their own special touches, things the imagineers wanted us to enjoy, not necessarily on our first time or our second time, or even our third. These are things that sometimes can take a while to appreciate. When put together, they can make up something really special. For this trip though, we start at the beginning. Main Street USA. It's the most "normal" of any of the lands in the Magic Kingdom. It's where you'll find the things you've forgotten, like batteries or sunscreen, it's where you can go make dining reservations or praise a cast member, it's even where you can get a hair cut. Wait...what? Did she just say get a hair cut? Why yes I did! 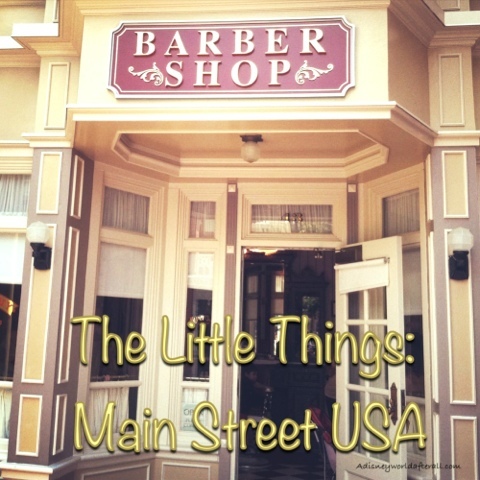 At the Main Street Barber Shop, guests can stop by and get their hair cut or pixie dusted at a very reasonable price! Brian has done this many a time and it's one of the things he loves to do when we're on vacation. Got a little one? Make sure to stop here to get their first haircut done! It is truly a special moment, ears and all! The Cast Members here are fabulous too! While it may seem like an odd thing to do on your vacation, it will be a memory that will stick with you forever too. Another thing I love about Main Street are the windows that can be found at the Emporium. Have you seen these? They are special displays that showcase scenes from some of Disney's classic movies? They are found more towards the beginning in the Town Square area. These are things that most people just pass by, but they are some of the most interesting Disney touches around. Did you know that in the middle portion of the street, there is an area off to the right side called Center Street? It used to run across completely, but after a refurb of the Emporium, that area was cannibalized by the store. However, this section still exists and is one of the quietest places in the entire park. It is a great place just to relax and if you listen carefully, you can hear some of the residents. In addition, this is an area where you can get those famous silhouette cutouts of yourself. Are you a fan of Casey's Corner? Then you already know about my next favorite thing. Did you know that there are great baseball nods inside this restaurant, but one of the best are the Disney baseball cartoons that play. Yes, you do have to sit on the bleachers to enjoy them, but it is a fun way to enjoy your time as you munch on corn dog nuggets. If you are sitting outside, you will see one of my other favorite, not noticed thing. The piano player. It adds so much just listening to ragtime music as you enjoy your lunch. Have you ever been walking towards Tomorrowland and noticed the small area below that is completely empty on the water? This used to be the entrance of the Swan Boats and it's another great little out of the way spot. Granted, there isn't seating here, but if you're looking for a place to meet up with your group, this is a great option that not many people think about.